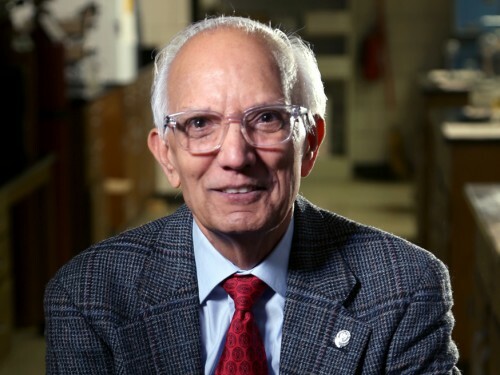 TOKYO—Rattan Lal, a soil scientist at The Ohio State University, has been awarded the 2019 Japan Prize, considered one of the most prestigious honors in science and technology. Lal is the first Ohio State scientist and the first soil scientist to ever receive the prize. He is Distinguished University Professor of Soil Science at the College of Food, Agricultural, and Environmental Sciences (CFAES). The Japan Prize recognizes scientists and engineers from around the world for original and outstanding achievements that “not only contribute to the advancement of science and technology, but also promote peace and prosperity for all mankind,” the Japan Prize Foundation said today (Jan. 16) in announcing the award. Lal, whose career in science spans five decades and five continents, was honored for his research on sustainable soil management and its role in improving global food security and mitigating climate change. Global food security is a growing issue because Earth’s population is expected to increase to near 10 billion people by 2050. Climate change is a concern because of its harmful effects, which include warming temperatures, melting glaciers, rising sea levels, and weather extremes, experts say. The selection process for the Japan Prize is highly competitive, with about 15,000 nominees vying for two awards every year, the foundation said. Polymer scientist Yoshio Okamoto of Japan’s Nagoya University also received the award this year. Lal was informed of the honor by a call from the Japanese consulate, he said. Lal is a faculty member in CFAES’ School of Environment and Natural Resources (SENR), where he conducts research on topics such as soil processes, soil degradation, and sustainable management of soil and water. He works both in Ohio and internationally. Soil degradation, a worldwide problem, includes a wide range of issues such as wind and water erosion, declines in soil fertility, organic matter loss, and contamination by chemicals. Lal also is the founder and director of SENR’s Carbon Management and Sequestration Center and is the past president of the 60,000-member International Union of Soil Sciences. He was born in Punjab, India (now part of Pakistan), and first came to Ohio State in 1968 to work on his PhD in soils. “The Ohio State University is proud that Professor Rattan Lal has been awarded the Japan Prize. As one of the world’s preeminent soil scientists, Professor Lal’s research and insights will continue to have a profound and enduring impact on global food security in the decades to come,” said Bruce A. McPheron, Ohio State’s executive vice president and provost. “Those of us at the College of Food, Agricultural, and Environmental Sciences are enormously proud of our colleague, Dr. Rattan Lal, and his incredible achievements. He is a distinguished scientist, with a prolific research portfolio, but he considers his primary contributions to be the many graduate students who have worked in his lab,” said Cathann A. Kress, Ohio State’s vice president for agricultural administration and dean of CFAES. “His story is one of perseverance, dedication, and humility—culminating in the recognition of Dr. Lal as one of the most influential scientists in the world,” Kress said. In announcing the award, the Japan Prize Foundation cited Lal’s pioneering research on no-tillage agriculture—a way to grow crops from year to year without disturbing the soil by tilling—and on methods to sequester, or lock up, carbon dioxide in the soil, such as by planting cover crops and spreading compost. Sequestering carbon dioxide removes it from the atmosphere, a plus in the fight against climate change. The amount of carbon dioxide in the atmosphere, which has continued to hit record high levels, is a primary cause of climate change. Lal and Okamoto will be honored in a ceremony on April 8 in Tokyo, whose thousand-plus attendees will include Japan’s Emperor Akihito, Empress Michiko, and Prime Minister Shinzo Abe. Lal and Okamoto will give lectures and participate in academic discussions during the ceremony week. The prize carries with it a cash award of $450,000, which Lal plans to donate to an endowment supporting staffing at the Carbon Management and Sequestration Center. Lal also recently received the Glinka World Soil Prize from the U.N. Food and Agriculture Organization and the World Agriculture Prize from the Global Confederation of Higher Education Associations for Agricultural and Life Sciences. He plans to donate the prizes’ cash awards to the carbon center as well.